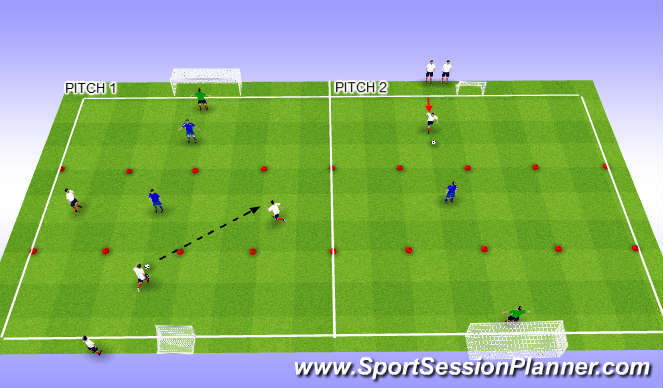 Football/Soccer Session (Moderate): 2v2 3v2 1v1 circuit. 2 pitches side by side both split into 3 zones. 2 goals with goal keepers and 2 deffenders on each pitch. Deffenders are locked into their zones. 2 attackers try to beat the deffenders and shoot on goal. Once a goal is scored or the ball has gone dead, the 2 attackers move onto the next pitch and the next 2 attack. 1, Decisions: When to pass, when to take the player on or when to shoot. Add an extra defender who can choose which pitch to defend on, he can switch pitches at any time to effect the numbers. 1, (Pitch 1) Players can now decide to attack 1v2 2v2 3v2 4v2. Goals can be added to the other end for defenders to score in if they win the ball.